Two weeks ago we reported the Obama administration was pushed through a small-pox vaccine costing $433-million dollars of taxpayer money even though there is doubt about whether the vaccine would work. There is also doubt whether the vaccine is necessary since WHO certified the eradication of smallpox in 1979 thanks to the work of the existing vaccine. That didn’t stop the Obama administration from awarding the contract for a new vaccine on a no-bid basis, to Siga Technologies Inc., whose controlling shareholder is billionaire Ronald O. Perelman, one of the world’s richest men and a longtime Democratic Party donor and the guy who gave $50,000 to help fund Obama’s inaugural bash. Perelman is most famous for his ownership of Revlon (he also almost killed Marvel Comics). Sen. Claire McCaskill, D-Mo., today called for investigation of the contract saying the five-year deal from the Department of Health and Human Services given to Siga Technologies raises questions about a conflict of interest and the potential waste of precious taxpayer funds. In a letter to HHS inspector general Daniel Levinson on Monday, McCaskill expressed worry over the hefty price of the drug (reportedly $255 per dose) because the company had not been not forced to compete for the contract. She also noted that the drug itself, known as ST-246, may not be effective since it has a short shelf-life and hasn’t been tested on humans. “I request that you review the circumstances surrounding the award of the contract, including whether it was reasonable in light of the risk of a smallpox outbreak and the reported shortfalls with the Siga Technologies vaccine,” she said. McCaskill chairs a Senate panel that oversees government contracts. I am pretty sure that this investigation request has absolutely nothing to do with the fact that McCaskill is running for re-election in 2012. Siga has spent more than $500,000 lobbying in Washington since 2009, according to the Center for Responsive Politics. During the 2008 presidential campaign, Obama promised to “ensure that federal contracts over $25,000 are competitively bid.” While his administration has put more contracts up for bidding than his predecessor, according to PolitiFact, it continues to award millions of dollars in sole-source contracts. No-bid contracts are just another area where Barack Obama has broken his promises to American voters. As for McCaskill it is nice that she is going against her party’s president in this issue, but it is not out of the “goodness of her heart.” Obama is not popular in her state, even the Senator’s popularity is not where an incumbent wants to be as she runs for re-elction. “We are going to see some epic Senate races,” said Jennifer Duffy, a Senate analyst for the nonpartisan Cook Political Report. One of the marquee contests will be in the Show-Me State, where first-term Democratic Sen. Claire McCaskill will be seeking re-election in the wake of her “Air Claire” tax problem. Her odds for re-election are now 50-50 at best, according to many analysts. Money won’t be one of her problems. And none of three Republican hopefuls is viewed as a sure-thing political powerhouse. But McCaskill has been a close ally of Obama in a state where his disapproval rating is more than 50 percent, according to a recent Public Policy Polling survey. This call for an investigation is a case of doing the right thing for the wrong reason. In the end it is a cynical political move. 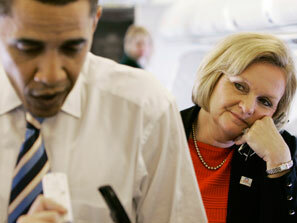 Its an attempt to distance herself from Obama before they both have to face the voters of Missouri.